Review Context: Played a couple of puzzle platform games from time to time. Usually play the genre when I want to unwind and test my mind. I have played all the Captain Toad levels in Super Mario 3D World. What first started as a minigame in Super Mario 3D World got good praise (from myself included) for being a highlight of the game. At E3 2014, Nintendo announced that it would become a full game. Some were wondering how the game would be in long spurts, as the game was fine in small spurts in Super Mario 3D World. As the game came close to release day it was announced that it would be budget priced, which had many people think twice about picking this game up. Will this treasure be worth looking for, or should it stayed buried? 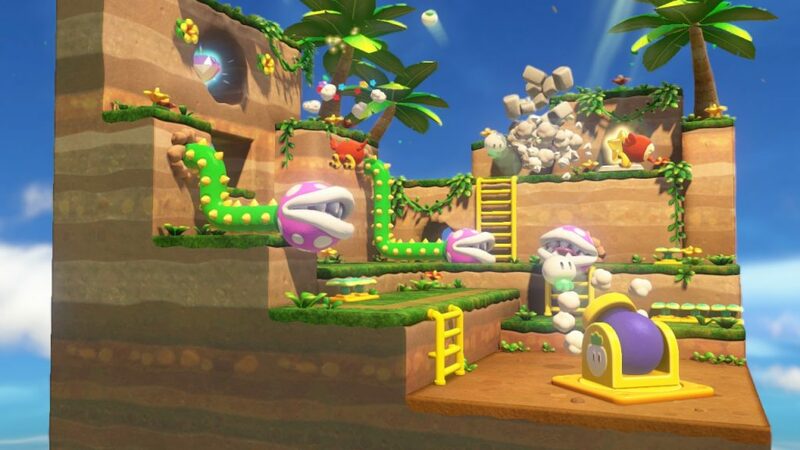 It comes as no surprise the game is using the Super Mario 3D World engine. Like all Nintendo games on Wii U, you get a colorful, yet detailed environment. When you zoom in on the levels you can see little details like cracks on the walls and grassy textures. When you leave the water Captain Toad’s clothes stay wet for a while. Captain Toad displays a lot of his personality. If you are in a snow level, he will try to warm himself with his arms. My favorite is when he’s in a haunted mansion and he starts to shake in fear when he comes across a Boo. With the game running at a smooth 60 frames a second, it helps with boss character’s fluid movements to time your attacks. This game only supports the Wii U Gamepad for things other than Off-TV play. There are moments where you have to look at the gamepad for aiming and moving platforms; for aiming you use the gamepad’s gyro sensor or the second analog stick. For moving platforms, you will either tap on the platform to move it, or there are times when you have to turn the wheel by making circular movements on the gamepad. Then on rare occasions, you will have to blow into the gamepad’s mic for moving platforms, which will feel weird, as you have to move the controller to your mouth while keeping an eye on the screen. Captain Toad is able to walk, run, and swim, but he can’t jump, thanks to his heavy backpack. Nice logical reasoning Nintendo! The only time the controls get a little tricky is when you obtain the double cherry in which you get multiple Toads. That’s when you have to be careful of how you move, since the other Toads are following your movements. You are able to turn Toad’s searchlight on or off. I see that as a novelty since the lighting in the game has me turn the light off, but when you’re in a haunted mansion that light is a godsend. 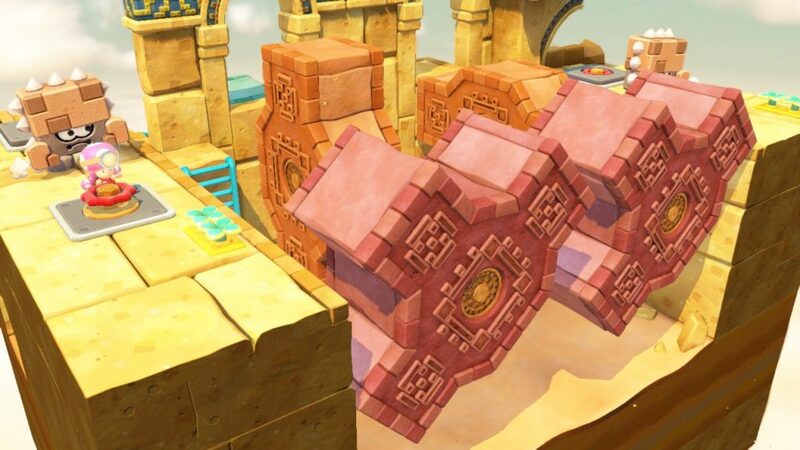 Another key feature of the game is with the level designs you will be using the right analog stick to rotate the level, as you will find hidden items and paths to take. This single player game is mixed with platforming and puzzle elements. It would be nice to have local co-op, but it’s not a loss in the end. When you boot the game up, you are treated with Captain Toad looking for treasure. Once you find it, you discover that it’s guarded by a big bird that is protecting the star of the treasure. 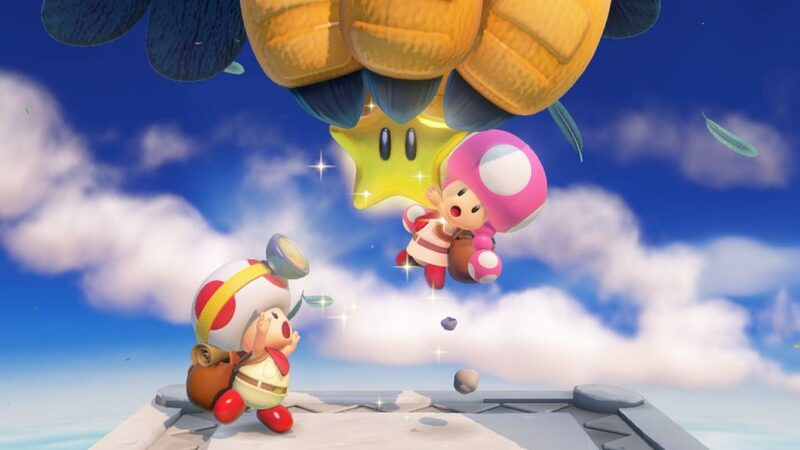 Not only does she steal the star, Toadette gets caught in the mix, but that’s not the entire story… If you stick around after the real credits, you’ll see how Captain Toad appears in Super Mario 3D World. You’ll have to guide Captain Toad (later Toadette) through over forty levels. The levels start off easy to get you to understand the game, then the levels go from easy to creatively hard. It should be noted, the difficulty is only bad if you decide to search for the hidden gems. If you just want to speed run the game, then the puzzles are easy to figure out. If you collect a gem but die, you will still have that gem. I’m sure this will lower the “rage” factor for some people. As an extra bonus, if the game detects save data from Super Mario 3D World, you get extra levels based on that game. Due to the lack of jumping, you have to think twice about where to go. The layouts are designed nicely to where you will be rotating the level a lot to find hidden items. You have power ups to help you; from turnips to defeat enemies with, the double cherry to create multiple Toads, to the old fashion pickaxe that acts as a hammer from Donkey Kong. Each level also has three hidden gems if you are looking for a challenge. There is also a hidden goal for each level, however the goal isn’t explained until after you beat the level. It would make sense to know what the goal is the first time, so you can achieve it then instead of later. The game has received a small patch update to support amiibos. If you use a Toad amiibo, each level will have an 8-bit Toad for you to find. Another thing about Nintendo games is the sound quality. While most of the music is recycled from Super Mario 3D World, there are some original pieces in here. I find myself humming the theme music. When you have me humming the theme, you have done your job on making a good soundtrack. 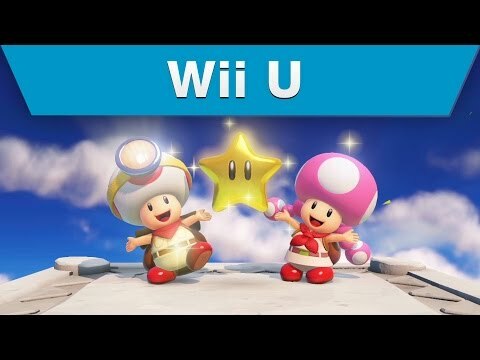 Captain Toad and Toadette have gargled voices that sound cute without being annoying. Even the enemies have cute sounds that make you feel bad for defeating them, especially the goombas sleeping on an inflatable swimming ring. Only in Mario and Kirby games do I always feel bad for the enemies.